We are here to help! United Appliance Repair is a trusted appliance repair service in Fullerton, CA. We are committed to quality customer service and care and provide immediate results. Our services include refrigerator repair, dishwasher repair, stove repair, dryer repair, washer repair and more! We do everything we can to prove to our customers how much we appreciate their trust. You are in good hands with United Appliance Repair! 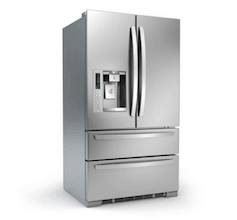 United Appliance Repair will repair every refrigerator and freezer problems for most popular brands. Our repairmen will fix touch panels, bulbs, leaks, water and ice dispensers, strange sounds, cooling issues, condensation problems, digital technology, ice makers and more. We will diagnose the defect then install manufacturer parts to complete the refrigerator repair. Learn more. A washing machine malfunction or dryer on the fritz is a serious inconvenience in a family home. You don’t have time for trips to the local laundromat. United Appliance Repair arrives on-time to repair the issue immediately. We can repair top- and front-loading models and noise, vibration, agitation, door, switch, control board and vent issues. 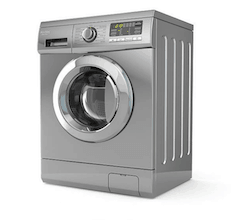 Same-day dryer repair or washing machine repair isn’t a problem for United Appliance Repair. Learn more. Customers can request our same-day service for dishwasher repair! Our repairmen know how to fix all dishwasher defects including – float switches, cloudy glassware, impellers, pump assemblies, smells, solenoids and several other parts. 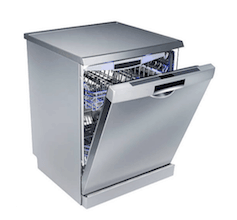 Your dishwasher is a complicated appliance and many defects can interrupt washing cycles. Some prevent drying. United Appliance Repair can identify and repair them all. Learn more. 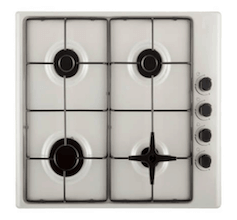 United Appliance Repair can repair broken ovens and stoves. Our repairmen can fix electric and gas models and most problems with ignitors, burners, relays, doors, bulbs, switches and more. We have the right tools and experience to repair all brands of stoves and ovens fast! This also includes the latest models and luxury brands. Learn more. United Appliance Repair is located in Fullerton, California. We serve several additional neighboring cities as well. You can count on our local, certified repairmen. All team members complete continuous hands-on education and training plus their years of field experience so we can promise we can perform all household appliance repair needs for our customers. Speed is one focus of our appliance repair service. We know how much of a hassle a broken home appliance can be. That’s why we offer same-day service to residents of Fullerton. Our goal is to complete our stove repair, refrigerator repair, washing machine repair, dishwasher repair and services on the same day you call and during our initial visit to your house. As quick as we can! The appliance brands we are familiar with include – Kenmore, Maytag, Whirlpool, Samsung, LG, GE, Kenmore, KitchenAid, Wolf Bosch, Sears, Sub-Zero, Amana, Frigidaire and more. See our Appliance Repair FAQ below. We load our service vans with manufacturer parts and include a 12-month warranty on all replacement parts and on our labor so we can guarantee customer satisfaction! Q. SHOULD YOU REPLACE OR REPAIR AN OLD APPLIANCE? A. A broken appliance in a house leads to two choices. 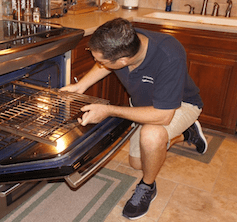 You can schedule professional appliance repair in an attempt to save money and keep using your old oven, refrigerator, dishwasher or dryer or washing machine or replace the broken appliance with a brand new model. Appliances have an expected lifetime. If your broken home appliance is within the earlier or middle stages of that lifetime, we would recommend scheduling our appliance repair service. If the home appliance is reaching the final part of its lifetime, we would then recommend to replace it with a new one if you can afford to. Q. CAN YOU OFFER A GUARANTEE OR WARRANTY? A. Yes. Our appliance repair service includes a 1-year warranty on all replacement parts and labor. We also use manufacturer replacement parts for LG, Frigidaire, GE, Sub-Zero, Kenmore, KitchenAid, Whirlpool, Wolf, Amana and many other common appliance brands in order to preserve the manufacturer’s warranty. Please don’t hesitate to call us anytime following our service if any issues continue with your household appliance. Q. WILL YOU FIX MY APPLIANCE ON THE INITIAL TRIP? A. In most cases. We stock our vans with over 90% of the most common manufacturer parts and all of the tools to perform our repair service. If we have to come back at a later time to wrap up a repair, there will be no additional service charge. We estimate we complete over 85% of our appliance repair appointments during the first visit. A. Yes. We provide a 1-2 hour window for our technician to be at your residence. We are aware of how important our customer’s time is and we do our best to ensure we arrive within the early portion of our timeframe. But, if a previous appointment or repair goes longer than anticipated, this timeframe allows the repairman a little time to still arrive on time during the service window. We call 10-20 minutes prior to their arrival for notice. Q. ARE YOU ABLE TO GIVE ME A FULL LIST OF ALL OF THE BRANDS YOU FIX? Our LG refrigerator would not start so I called United Appliance Repair in Fullerton. The technician was able to come to our our house later in the afternoon. He repaired it so fast! United Appliance Repair fixed the stove in my apartment. The repairman was really nice. Very happy with the experience! United Appliance Repair is the only appliance repair service in Fullerton I trust! Their prices are reasonable and their repairmen are reliable. 100% recommend.